This monster appears in the artworks of Attack Reflector Unit, Cybernetic Hidden Technology, Final Fusion, Cyber Repair Plant, Evolution Burst, Cyber Network, Cyberload Fusion and Cybernetic Revolution. This card appears in the artwork of Three of a Kind and Tribute Trade. In Yu-Gi-Oh! World Championship 2007 and Yu-Gi-Oh! World Championship 2008, the hologram for Cyber Dragon was of its second artwork. The name Cyber Dragon is listed in the text of more cards than any other card name in Yu-Gi-Oh, being listed on over 30 different cards. This monster is possibly based on the Chinese dragon. Cyber Laser Dragon and Cyber Barrier Dragon as upgraded Counterparts, as their Summoning methods explicitly mention this card. In terms of design, Cyber Eltanin could also fit in this category. Cyber Twin, End and Eternity Dragon as Fusion Counterparts, the two former simply being amalgamations of 2 or 3 Cyber Dragons. Chimeratech Over-, Fortress, Rampage and Megafleet Dragon are DARK Fusion Counterparts. Cyber Dragon Nova and Infinity as upgraded Xyz Counterparts. Cyber Dragon Zwei, Drei and Vier, whose names are the German for Two, Three and Four, and have effects that change their names into Cyber Dragon, making them watered-down or situational versions of this monster. The design and effects of Proto-Cyber Dragon, Cyber Dragon Core, Herz and Nachster imply that they are forerunners to this monster, being gradually transformed into more complex forms. In terms of general appearance, Cyber Valley could also fit in this category. Toon Cyber Dragon as a Toon Counterpart. Cyber Dragon Sieger as an upgraded Link Counterpart. Machina Fortress: Special Summoning this monster with its effect does not start a Chain, similar to Special Summoning Cyber Dragon. Cyber Dragon Zwei: If you activate "Inferno Reckless Summon" when "Proto-Cyber Dragon" is Summoned while you have 1 "Cyber Dragon" in your Deck and 3 "Cyber Dragon Zwei" in your Graveyard and only 3 Monster Card Zones open, you choose which monsters you want to Special Summon. Any monster that you cannot Special Summon is sent to the Graveyard. Cyber Dragon Zwei: If "Cyber Dragon Zwei" is being treated as "Cyber Dragon" by its own effect and "Skill Drain" is activated, the name is still treated as "Cyber Dragon. Shreddder: If you reduce the Level of the monsters in your hand with "Cost Down" then you can only target monsters whose Level is less than or equal to the monster's Level in your hand. Example: "Cyber Dragon" in your hand is being treated as Level 3 with "Cost Down." You can only send it to the Graveyard as a cost to target a Level 3 or lower monster. Shreddder: If you increase the Level of a monster in your hand with "Level Conversion Lab" you can only send it to the Graveyard to target a monster whose Level is less than or equal to the original Level of the monster in your hand. Example: "Cyber Dragon" in your hand is being treated as Level 6 with "Level Conversion Lab." You can only send it to the Graveyard to target a monster that is Level 5 or lower. Zeta Reticulant: The effect of “Zeta Reticulant” to Special Summon itself from your hand has no effect type. Like “Cyber Dragon”, it is merely a procedure to Special Summon. If "Solemn Judgment" is activated to negate the Special Summon of "Cyber Dragon", then "Cyber Dragon" is not considered to be in the hand when the effect of "Solemn Judgment" resolves. Thus, if a player controls "The Fabled Unicore", both players have 5 cards in their hands, and "Solemn Judgment" is activated when "Cyber Dragon" is being Special Summoned, then when resolving the effect of "Solemn Judgment" one player has 4 cards in his hand and the other player has 5, so the effect of "The Fabled Unicore" is not applied and the effect of "Solemn Judgment" will not be negated. : If "Solemn Judgment" is activated when Special Summoning "Cyber Dragon", then will it be negated by the effect of "The Fabled Unicore"? Cyber Dragon Zwei: "Cyber Dragon Zwei" is not treated as "Cyber Dragon" while "Cyber Dragon Zwei" is in the Deck. Thus, you can include three copies of "Cyber Dragon Zwei" and a additional copy of "Cyber Dragon" in the same Deck. : Can you put "Cyber Dragon" into a Deck which contains three copies of "Cyber Dragon Zwei"? You can negate Synchro Summons, Xyz Summons, and the Special Summon of monsters like "Chaos Sorcerer" and "Cyber Dragon" which do not start Chain Links. Inferno Reckless Summon: If you have three copies each of "Cyber Dragon Zwei" and "Cyber Dragon" in your Graveyard, then you can activate "Inferno Reckless Summon" when "Proto-Cyber Dragon" is Special Summoned, even though you do not have enough open Monster Card Zones. When resolving "Inferno Reckless Summon", you select and Special Summon as many monsters as possible. Also, copies of "Cyber Dragonnolink=1 in your Graveyard, then can "Inferno Reckless Summon" be activated? "Number 16: Shock Master: If you declare "Monster Card", then you cannot activate the Ignition/Trigger/Quick/Flip Effects of monsters. You can still Normal Summon or Set monsters, and you can still perform Special Summons that do not use a Chain Link, like that of "Cyber Dragon" or "Dark Armed Dragon". Continuous Effects (which do not use Chain Links) are applied normally. : If Monster Cards are declared for the effect of "Number 16: Shock Master", then do things like Normal Summons become impossible? Parallel World Fusion: If the Special Summon of a monster like "Cyber Dragon" is negated - such as by "Solemn Judgment" or "Royal Oppression" - then you still cannot activate "Parallel World Fusion" during the same turn. : Can you Special Summon during the same turn in which "Parallel World Fusion" was negated by an effect like "Solemn Judgment" or "Royal Oppression"? Proto-Cyber Dragon: If "Proto-Cyber Dragon" is face-up on the field and has its name treated as "Cyber Dragon", then you can use it as a Fusion Material for "Cyber Twin Dragon" or "Cyber End Dragon". : Can you use "Proto-Cyber Dragon" as a Fusion Material for "Cyber End Dragon"? Royal Oppression: When your opponent is Special Summoning a monster like "Chaos Sorcerer" or "Cyber Dragon" through its condition, you cannot activate a set "Royal Oppression" without also activating its effect. : If Special Summoning "Cyber Dragon" (etc. ), then can you only activate the card "Royal Oppression"? You can only use the effect of "Cyber Dragon" to Special Summon itself during your Main Phase. The effect of "Cyber Dragon" does not start a chain. You can negate the Special Summon of "Cyber Dragon" with "Royal Oppression", "Solemn Judgment", or "Horn of Heaven". Black Horn of Heaven: Like "Horn of Heaven", this card cannot be used against "Premature Burial", etc. It can be used against inherent Special Summon effects like "Cyber Dragon"
Horn of Heaven: "Horn of Heaven" can be used to negate the Special Summon of a monster with an inherent Special Summon effect that does not start a Chain, like "Cyber Dragon", . Prime Material Dragon: If "Royal Oppression's" effect is activated to negate the Special Summon of a monster, like "Cyber Dragon" or "Gladiator Beast Gyzarus", "Prime Material Dragon's" effect cannot be chained because the monster being Special Summoned is not considered to be "on the field" until its Summon is successful. Queen of Thorns: If you Normal Summon a monster from your hand, or Special Summon a monster with an "inherent" Special Summon effect ("Cyber Dragon", etc. ), first you pay 1000 Life Points and then Normal Summon/Special Summon the monster. .
Solemn Judgment: "Solemn Judgment" can negate the Special Summon of a monster that is Special Summoned through its own inherent Special Summon effect that does not start a Chain, like "Cyber Dragon" . Stardust Dragon: If "Royal Oppression's" effect is activated to negate the Special Summon of a monster, like "Cyber Dragon" or "Gladiator Beast Gyzarus", "Stardust Dragon's" effect cannot be chained because the monster being Special Summoned is not considered to be "on the field" until its Summon is successful. Attack Reflector Unit: You can Tribute a face-down "Cyber Dragon" to activate "Attack Reflector Unit". Chimeratech Overdragon: When you Fusion Summon this card you can use a substitute, such as "King of the Swamp", for the "Cyber Dragon", but not for the Machine-Type monsters. That means you can use a maximum of 1 substitute monster in the Fusion Summon. Generation Shift: If you target "Proto-Cyber Dragon" or "Elemental Hero Neo Bubbleman" with this effect, you must add "Proto-Cyber Dragon" or "Elemental Hero Neo Bubbleman" to your hand. You cannot add "Cyber Dragon"
Inferno Reckless Summon: If you activate "Inferno Reckless Summon" when you Special Summon "Proto-Cyber Dragon", you will Special Summon "Cyber Dragon" from your hand, Deck, and Graveyard. Karma Cut: If "Proto-Cyber Dragon" is removed from play by "Karma Cut", only other "Proto-Cyber Dragon" cards will be removed from play. "Cyber Dragon" is not affected. Neo-Spacian Dark Panther: When you use this card's effect to copy another monster's name, its name is not considered to be "Neo-Spacian Dark Panther" for the duration of the effect. If you targeted "Cyber Dragon" then activate "Next to be Lost" you would send a "Cyber Dragon" from your Deck to the Graveyard and not "Neo-Spacian Dark Panther". Neo-Spacian Dark Panther: If you target "Proto-Cyber Dragon", "Neo-Spacian Dark Panther's" name will be treated as "Cyber Dragon" because of the copied effect. Next to be Lost: If you target "Proto-Cyber Dragon" on your side of the field for "Next to be Lost", you send a "Cyber Dragon" from your Deck to the Graveyard, not a "Proto-Cyber Dragon". Proto-Cyber Dragon: If "Skill Drain" is active, this card is no longer treated as "Cyber Dragon". You could not use it for "Attack Reflector Unit", etc. Proto-Cyber Dragon: You can have 3 "Cyber Dragon" and 3 "Proto-Cyber Dragon" in your Deck and Side Deck combined. Proto-Cyber Dragon: If you Special Summon this card you can activate "Inferno Reckless Summon" and Special Summon "Cyber Dragon" from your Deck. Proto-Cyber Dragon: While this card is face-up on the field, it can be used as "Cyber Dragon" for a Fusion Summon. Proto-Cyber Dragon: If "Prohibition" is activated choosing "Cyber Dragon", "Proto-Cyber Dragon" will not have its name treated as "Cyber Dragon" and can still attack and change its battle position. The Six Samurai - Zanji: If you have "The Six Samurai - Zanji" and "The Six Samurai - Irou" on your side of the field and "The Six Samurai - Zanji" attacks your opponent's Attack Position "Cyber Dragon", if you select to have "The Six Samurai - Irou" be destroyed instead the "Cyber Dragon" will not be destroyed by "The Six Samurai - Zanji's" effect because "The Six Samurai - Irou" will not be on your side of the field when "The Six Samurai - Zanji's" effect resolves. Megamorph: When an effect modifies, doubles, or halves the original ATK of a monster, you must apply this first. After calculating this value (the monster's new current ATK), any gains or losses (increases or decreases) to the monster's ATK are applied to the calculated value. Example: If a "Cyber Dragon" equipped with "Axe of Despair" is equipped with "Megamorph", it would have its 2100 original ATK doubled to create a new current ATK of 4200. This value is further increased by 1000 due to "Axe of Despair", for a total of 5200.: Megamorph problems! 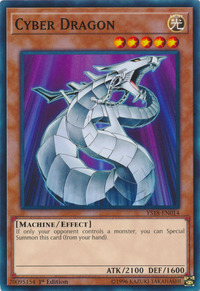 Ring of Destruction: If "Ring of Destruction" is activated targeting "Cyber Dragon" and "Limiter Removal" is chained, then "Limiter Removal" resolves first and doubles "Cyber Dragon's" ATK, from 2100 to 4200, and then "Ring of Destruction" resolves and destroys the "Cyber Dragon", inflicting 4200 damage to both players' Life Points. : Ring of Destruction vs Limiter RemovalThe latest print of "Ring of Destruction" uses Problem-Solving Card Text, which states that the damage dealt is equal to the monster's original ATK. This difference is due to a major change in the functionality of "Ring of Destruction".